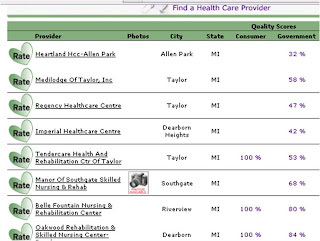 WhereToFindCare.com Blog: When driving, you look twice for motorcycles... what about decisions on nursing homes? 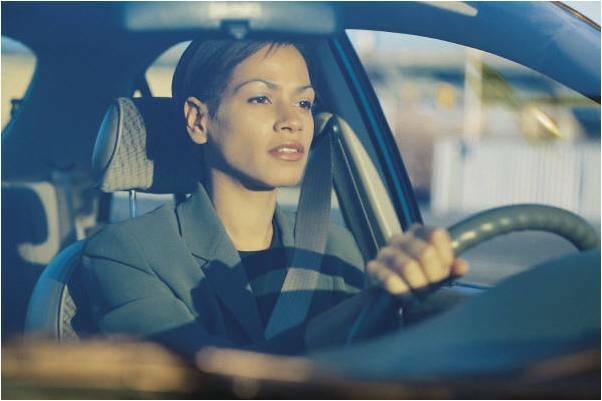 When driving, you look twice for motorcycles... what about decisions on nursing homes? Often, choosing a nursing home comes with a tight deadline. Most admissions are from a hospital and discharge planners may be unaware of quality issues associated with the very choices they are offering to their patients and families. Enter: The WhereToFindCare.com Team. 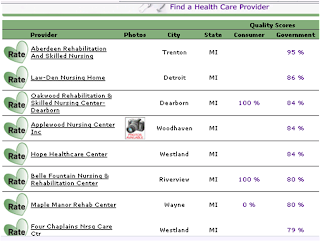 We have created a simple search that gives you area nursing homes along with their quality scores on measures (processes) that Medicare has determined are important. A search of the Allen Park, Michigan zip code (48101) yields quite a few nursing homes as you can see in the picture to the right. The list is sorted according to proximity to the zip code. As you can see many have low quality scores according to the medicare data and families may think they have no choice other than to place mom or dad in a less than desirable nursing home. This is not the case. How can you find out who has the best quality score? By clicking on the word Government directly under the Quality section - the list will be sorted in order of high to low or low to high. Of course if are like me, you prefer to look at the best first- sort high to low and the area's nursing homes will be sorted in order of quality. See screen shot to the right. 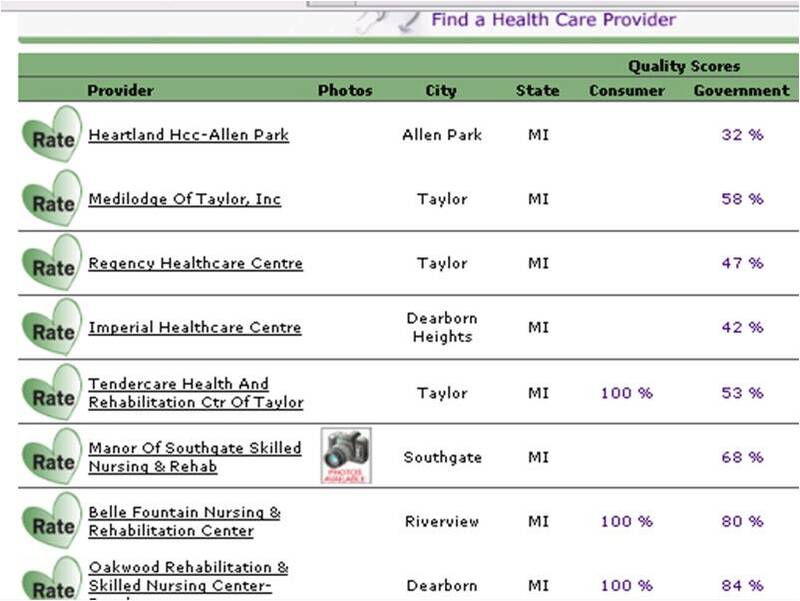 Did you notice the results changed and Trenton, Detroit, and Dearborn skilled nursing homes area now at the top. Taking a second look at your choices can be done in less than 30 seconds. Give it a try here. 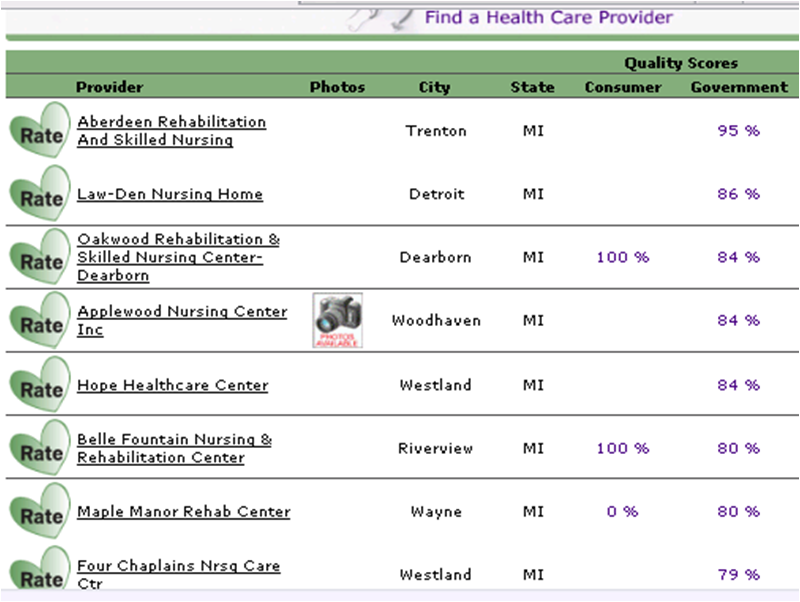 To view information on a specific nursing home use this simple nursing home search. Just select your state and click GO.